John Walsh's quizzical observer, in 'pre-Troubles' Derry, backpacking in Bavaria, or coming 'home' to post-Wall Berlin - whether musing on a lake-locked mansion, fulminating at the news' excesses or recalling vanished boyhood heroes - finds much virtue in small things, value in the overlooked, validation in nature's persistence. Engaged, like the Eliot of his title, in salvaging the poetic and the good from society's wastelands, his wry gaze and gentle tone conjure an art, and a world, that are ethically rooted, authentic, and ultimately heartening. John Walsh's work is brave, vibrant and immensely accessible. At its best, the writing achieves a rare transparency. There are powerful poems here where we, seamlessly, get to see the world through his eyes and are greatly enriched by the experience. John Walsh was born in Derry in 1950. After sixteen years teaching English in Germany, in 1989 he returned to live in Connemara. His first collection Johnny tell Them was published by Guildhall Press (Derry) in October 2006. In 2007 he received a Publication Award from Galway County Council to publish his second collection Love's Enterprise Zone (Doire Press, Connemara). 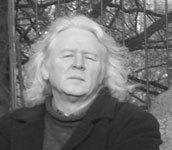 His poems have been published in Ireland, the UK and Austria and he has read and performed his poems at events in Ireland, the UK, Germany and Sweden. He is organizer and MC of the successful performance poetry event North Beach Poetry Nights in the Crane Bar, Galway. He has also been known to show up with his guitar and deliver one or two of his own songs. Chopping Wood with T.S. Eliot is a collection of sixty new poems to celebrate his reaching the mature age of sixty. A bird just hit the kitchen window. A dull thud. Maybe not too hard. the feeling the energy is wrong. that I haven't yet cleared away. Maybe this won't happen for a whole year. nose-diving into these big window panes. That's what makes it so worrying, so strange. hospitals and big office blocks. But I think that would look weird. This is my home. I live here. I am the one who planted the trees. I remember the early years. Not a thrush, a blackbird to be heard. how easily it could tip the other way. 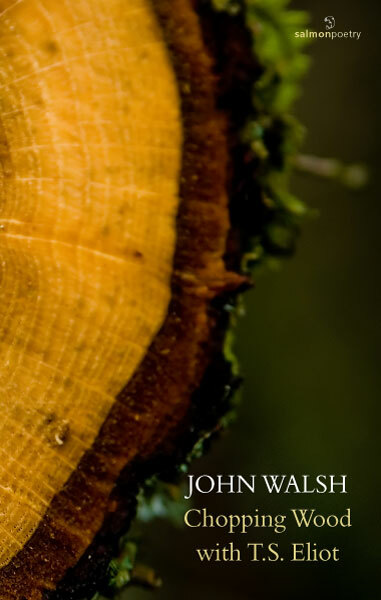 John Walsh's Chopping Wood with T.S Eliot published, Salmon Poetry 2010, is a taut wonderfully controlled collection of poems that forms a panoramic exposition of modernism but never once sacrifices form to mere expressiveness. There is a directness about Walsh's vision that is encapsulated in each poem's edifice or super-structure. Chopping Wood with T.S Eliot provides an exemplar of how form and distillation free the poet's voice. This puts me in mind of Ted Hughes' reference to his practice of sometimes retaining an image in his 'black box flight-recorder', the poet wryly observes disaster and proceeds to condense it spectacularly, be it about Tara in Yes Minister, or the dangerous beginning-flight of the bird in Tipping Point. 'Tipping Point' is the pivot upon which the book turns, it is editorially placed almost at centre of this work , and it interweaves it's theme with the other poems in a manner that denies simple utilitarianism or easy answers to the conundrums the author likes to present the reader with. Tipping Pointis the weft , the dark thread, that landscapes this book, be it in frank memory of his native county or in our peculiar Irish euphemisms for war and grief. The colours that dominate this book are the dark-greens of bower and forest, or multiple shades of russet, red, wine, blackberry and autumnal shades. These colours are not decorative nor are they intended to be so, they provide a backdrop to the business of living. Tipping Point is an almost obdurate poem. The poet works with his hands and he's not going to change an iota of his creation to accommodate the wee bird that comes bashing and smashing into his careful construction. 'A bird just hit the kitchen window. A dull thud. Maybe too hard. Later, the sense of pity and concern is balanced against the author's own creation,his home and how an unexpected occurrence, such as harm , cannot be allowed to interfere with the idea of home. There cannot be a compromise for 'safety' countenanced by the owner, who has planted the trees, who has constructed from his hands the place that is his and those of his family. how easily it could tip the other way." (Stanza 6 ) I feel sorry for them." no good for eating, best left to wither on their stems. "With all due respect, I feel he carries it a bit too far. when all it really means is mouths to feed. never mind attending to other people's needs. Walsh never once breaks with either form or lyricism, the poems look clean on the page. But sure noody listens to him." The debacle at Tara and a severe inability to join the dots on policy in ecological issues is something both the press and government have not realised is in the gift of the poet who will sing and describe the characters and miscreants as part of their observations and ideas about Ireland. This is a magnificently understated poem , which likens the Minister to Lady Macbeth. We do not think he will ever get his hands clean. The words and actions of government do not tally with each other. Few historical episodes in the Irish annals have exposed such a failure in duty, it is the poet's place to chronicle these disasters when the reams of press-release have been consigned to the shredder or tip. Words will have their veracity, of that the poet is completely sure. He is writing a celebratory work , a memoir and he invites us to partake of it's history. It is not a wonderment but a voice of experience. It is up to the reader to delve into what we have created here in terms of our flawed grasp for modernity. The poet will not hide it from us. He makes us look at what prescriptive and hollow language has achieved for us in the midst of an apocalypse of ecological disaster brought on by our willingness to accept the drone of political language and refusal to look at what our hand has achieved.